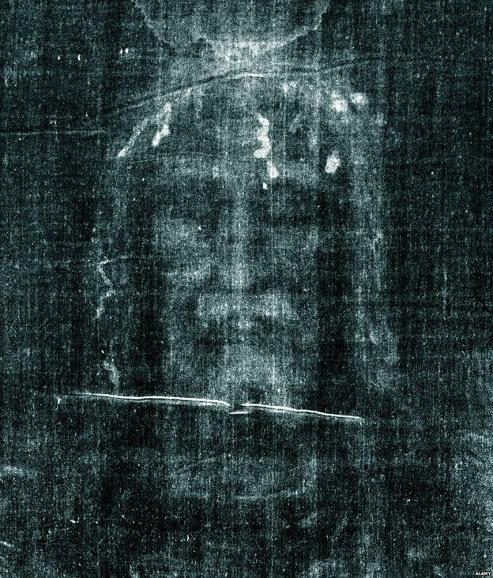 How did the Turin Shroud get its image? On Sunday, Pope Francis will "venerate" the famous Shroud of Turin, which is thought by some to be the burial wrapping of Jesus Christ - and by others to be a medieval fake. Whatever it is, it's a mystery how the cloth came to bear the image of a man. Science writer Philip Ball discusses the theories. 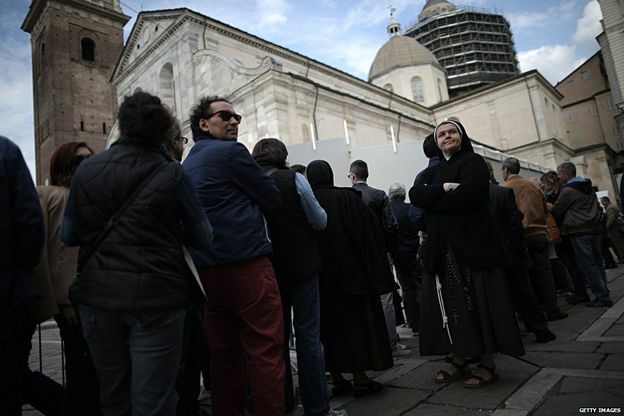 In a carefully worded announcement, the Archbishop of Turin says that the Pope "confirms the devotion to the shroud that millions of pilgrims recognise as a sign of the mystery of the passion and death of the Lord". You'll notice that this says nothing about its authenticity. The Catholic Church takes no official position on that, stating only that it is a matter for scientific investigation. Ever since radiocarbon dating in 1989 proclaimed the 14ft by 4ft piece of linen to be roughly 700 years old, the Church has avoided claiming that it is anything more than an "icon" of Christian devotion. But regardless of the continuing arguments about its age (summarised in the box at the bottom of this page) the Shroud of Turin is a deeply puzzling object. Studies in 1978 by an international team of experts - the Shroud of Turin Research Project (Sturp) - delivered no clear explanation of how the cloth came to bear the faint imprint of a bearded man apparently bearing the wounds of crucifixion. There's no shortage of hypotheses. Some suggest that the image came about through natural processes; some impute considerable ingenuity to medieval forgers of relics; others invoke wondrous physical processes associated with the Resurrection. But do any have any merit? 1. Is it a painting? If this were true, it should be possible to identify the pigments used by chemical analysis, just as conservators can do for the paintings of Old Masters. But the Sturp team found no evidence of any pigments or dyes on the cloth in sufficient amounts to explain the image. Nor are there any signs of it being rendered in brush strokes. In fact the image on the linen is barely visible to the naked eye, and wasn't identified at all until 1898, when it became apparent in the negative image of a photograph taken by Secondo Pia, an amateur Italian photographer. The faint coloration of the flax fibres isn't caused by any darker substance being laid on top or infused into them - it's the very material of the fibres themselves that has darkened. And in contrast to most dyeing or painting methods, the colouring cannot be dissolved, bleached or altered by most standard chemical agents. The Sturp group asserted that the image is the real form of a "scourged, crucified man… not the product of an artist". There are genuine bloodstains on the cloth, and we even know the blood group (AB, if you're interested). There are traces of human DNA too, although it is badly degraded. That didn't prevent the American independent chemical and microscopy consultant, Walter McCrone, who collaborated with the Sturp team, from asserting that the red stains attributed to blood were in fact very tiny particles of the red pigment iron oxide, or red ochre. Like just about every other aspect of the shroud, McCrone's evidence is disputed; few now credit it. Another idea is that the image is a kind of rubbing made from a bas-relief statue, or perhaps imprinted by singeing the fabric while it lay on top of such a bas-relief - but the physical and chemical features of the image don't support this. If the coloured imprint comes from the darkening of the cellulose fibres of the cloth, what might have caused it? One of the doyens of scientific testing of the shroud, Raymond Rogers of the Los Alamos National Laboratory in New Mexico, argued in 2002 that a simple chemical transformation could do the job. He suggested that even very moderate heat - perhaps 40C (104F) or so, a temperature that post-mortem physicians told him a dead body could briefly attain if the person died from hyperthermia or dehydration - could be enough to discolour the sugary carbohydrate compounds that might be found on the surface of cotton fibres. It doesn't take a miracle, Rogers insisted. This is a reassuringly mundane idea, but there is little evidence for it in this particular circumstance - it's not as if it happens all the time on funeral shrouds. Another idea is that the discoloration of the fibres was caused by a chemical reaction with some substance that emanated from the body. The French biologist, Paul Vignon, proposed in the early 1900s that this substance might have been ammonia, produced by the breakdown of urea in sweat. That won't work, though: the image would be too blurry. In 1982, biophysicist John DeSalvo suggested instead that the substance could be lactic acid from sweat. This compound is one of those responsible for so-called Volckringer images of plant leaves, left for years between the pages of a book: substances are exuded from the leaf and react with paper fibres to produce a dark, negative image. Secondo Pia's photograph showed that the image on the cloth is a negative: dark where it should be bright. This deepens the mystery, and Pia himself casually suggested that the shroud could have been made by some primitive kind of photography. That idea has been inventively pursued by South African art historian Nicholas Allen, who argues that it could in principle have been achieved using materials and knowledge available to medieval scholars many centuries before genuine photography was invented. The key to the idea is the light-sensitive compound silver nitrate, the stuff that darkened the emulsion of the first true photographic plates in the 19th Century, as light transformed the silver salt into tiny black particles of silver metal. This substance does seem to have been known in the Middle Ages, Allen says: it was described in the writings of the 8th Century Arabic alchemist, Jabir ibn Hayyan, and also by the German Dominican Albertus Magnus in the 13th Century. It could have been coated on to the cloth in a darkened chamber and exposed to sunlight through a lens - made of quartz not glass, since the silver is in fact darkened by ultraviolet light, which glass absorbs but quartz does not. Allen has made replicas of a shroud this way using model figurines. But how the image stays on the cloth when the silver is removed, and how mediaeval forgers gathered all this sophisticated knowledge about optics and chemistry without there being any trace in surviving documents poses problems for the idea. So do various issues about the exact shape and contrast of an image made this way. For most Turin Shroud theorists, Allen's idea is a triumph of ingenuity over plausibility. 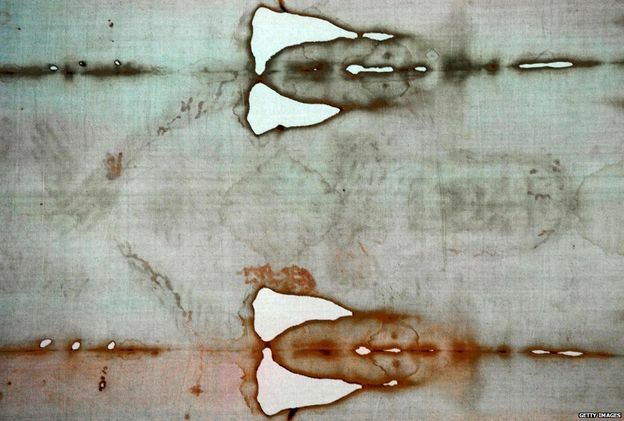 According to an international team of scientists and other interested folk called the Yahoo Shroud Science Group, hypotheses about the genesis of the shroud "involving the Resurrection of Jesus of Nazareth cannot be rejected". Among them, the group members write, "are hypotheses correlated to an energy source coming from the enveloped or wrapped Man, [and] others correlated to surface electrostatic discharges caused by an electric field". Since these hypotheses appear to invoke processes unknown to science, which presumably occur during a return from the dead, it's technically true that science can't disprove them - nor really say anything about them at all. Some, however, are not deterred by that. Italian chemist Giulio Fanti of the University of Padua has proposed that the image might have been burnt into the upper layers of the cloth by a burst of "radiant energy" - bright light, ultraviolet light, X-rays or streams of fundamental particles - emanating from the body itself. Fanti cites the account of Christ's Transfiguration, witnessed by Peter, John and James and recounted in Luke 9:29: "As he was praying, the appearance of his face changed, and his clothes became as bright as a flash of lightning." This is, to put it mildly, rather circumstantial evidence. But Fanti suggests we might at least test whether artificial sources of such radiation can produce a similar result on linen. According Raymond Rogers, all kinds of pseudoscientific theories have been put forward that invoke some mysterious radiation, which not only made the image itself but distorted the radiocarbon dating. In general they start from the notion that the shroud must be genuine and work backwards from that goal, he said. Little has changed in the decade and more since Rogers made this complaint. But still it has to be said that the piece of cloth Pope Francis will venerate is genuinely and stubbornly perplexing. How old is the Shroud of Turin? 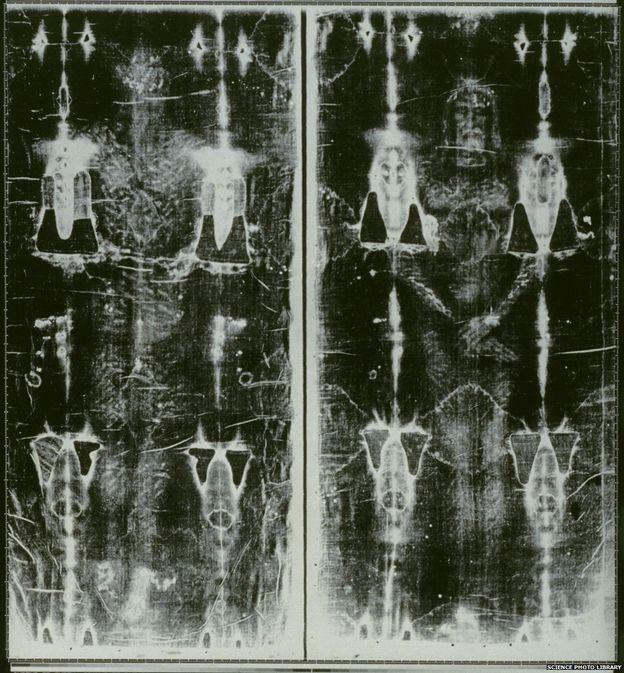 In 1989 it looked for a moment as though the link between the Turin Shroud and the burial of Christ was finally broken. Three independent teams of scientists had been given scraps of the linen, which they analysed using radiocarbon dating - a technique that uses the decay of a natural, radioactive form of carbon to figure out how long ago a once-living sample ceased to be alive (and thus in this case when the cloth was made from plant fibres). The verdict: the shroud dates from between about 1260 and 1390. It was a medieval item. But almost at once, objections were raised. Some argued that the samples tested had come from later additions to the original cloth. Others said that the radiocarbon "clock" had been reset by a fire in the 16th Century that damaged parts of the shroud, or that the findings were distorted by the more recent growth of bacterial or fungal "biofilms" on the threads. The authors of the 1989 paper have discounted those possibilities, but the controversy won't die down. In 2013 Giulio Fanti described dating studies on the shroud using a non-standard method involving spectroscopy (absorption of light of different colours), which he says place the age instead between 300 BC and 400 AD: perfect for true believers. Click to return to "Grapevine News"